This is a rectangular Patek’s Paints porcelain sign. This particular Patek’s Paints sign is predominantly beige with black and yellow text. 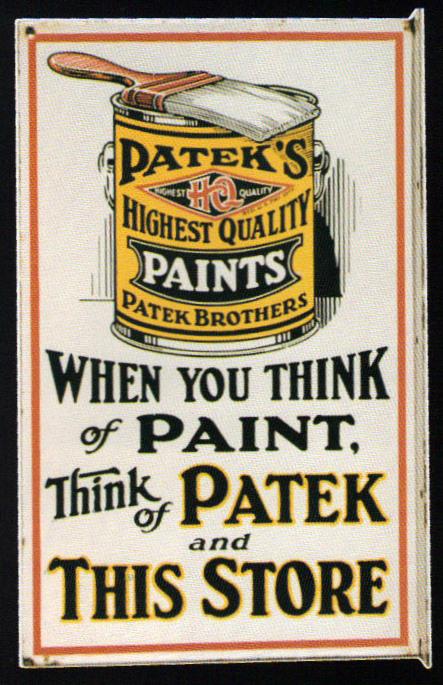 It reads, “Patek’s Highest Quality Paints, Patek Brothers, When You Think Of Paint, Think Of Patek and This Store” and features a yellow can of Patek’s Paints and a white paintbrush at the top of the sign.